Why Choose AIMA’s Revenue Cycle Management Services? Breadth of services – We’re a team of highly experienced revenue cycle management and healthcare IT experts. We deal with small practices, large laboratories, and enterprise clients to improve revenue cycle management processes and financial outcomes. Our service includes expert teams that take care of your medical coding, eligibility verification, medical claims submission, patient statement processing, claim denial review and appeals, patient billing questions and phone call management, claim follow up, and financial reporting and tracking of key performance indicators. 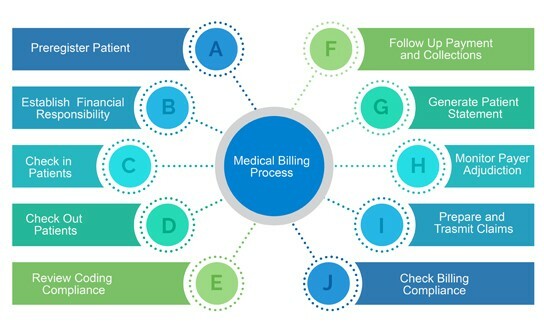 Tailored service – Whether a physician or lab owner needs help in submitting clean claims, managing denials or pursuing unpaid claims, real-time eligibility assurance, coding or front desk processes like patient billing and collections we can help them get paid the right amount, quickly. Our account managers are organized to provide personalized service and comprehensive support by knowing the physician practice inside and out. Fast lead in time – Proven ability to work with multiple client-preferred systems, time is of the essence, we will use your existing systems to speed up on-boarding. Delivering high performance on all critical workflows such as verification of benefits, charge entry, coding, demographic entry, payment posting and AR collections. Our staff are trained and certified extensively on reputed practice management system platforms including but not limited to: e-clinical Works, Allscripts, Iridium Suite, PracticeFusion, Medgen, Labgen LIS, etc. Our highly experienced Eligibility & Verification teams will be quick to gathering authorizations and referrals for you! Flexibility – All services are provided on whichever electronic health records software is utilized by the medical practice. We provide revenue cycle management services on multiple EHR systems, including Medgen, Kareo, GE centricity, IDX, Allscripts, eClinicalWorks, Criterions, Labgen and others. Increased efficiency & profitability – highly focused, people and technology driven system averaging a 40% cost savings and 15% increase in revenues for our customers. Standardised workflow – Well defined workflows that specifically address issues related to outstanding claims and denials, helping health systems perform optimally. Our standardized program is capable of handling any scope of business, following specific Quality Standards based on the HFMA standards for ensuring a healthy financial performance. Reporting & Communication – Full integration of Key Performance Indicators across the service spectrum providing meaningful reports and dashboards weekly and monthly, maintaining high level of data integrity. We are confident in our secure, affordable systems and processes built to discover key issues in Revenue Cycle Management, featuring results driven billing strategies during the claims processing. Automation – In-built automated capability to handle large claim volumes ensuring marked reduction in processing time and leading to faster claims processing cycle and workforce efficiency. Client control & protecting patient data – Maximum control over Patients’ claim data allowing customizable views and actions executable after thorough understanding of key pain points in revenue cycle analysis. All our client communications are carried out on the most advanced HIPPA compliant encrypted IT platforms.